Buy the Farm . . . Share: Soup and Salad . . . in ONE! Today was the first day off of work in a month where I spent less than an hour monkeying around with Ikea furniture. I did, however, spend some time tidying, cleaning, doing six loads of laundry, and installing the bases to our car seats. That last chore was made a little more annoying when I foolishly remembered that I need to pick people up from the train station tomorrow evening, meaning I'm going to get some practice at uninstalling and reinstalling them very soon. The most annoying task of the day was our new bi-weekly task of spending an hour at the hospital with Jen and the babies hooked up to all manner of monitor so we can listen to their hearts beat for an hour. The doctors are hell bent on diagnosing Jen with some life-threatening pregnancy complication but for them it's a race against time. They only really have about six weeks left to have their alarmist dreams come true. So far the babies have not been cooperating with their doctors' Chicken Little predictions. After driving home from the hospital it was time for week two of this year's farm share pickup. 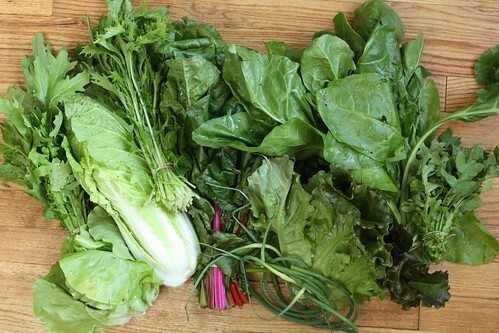 This week's delivery consisted of six garlic scapes and one bunch each of red lettuce, green lettuce, arugula, Swiss chard, summer spinach, mustard greens, mizuna, and Chinese cabbage. One of Jen's recent pregnancy anti-cravings has been salad. This is an incredibly unfortunate turn of events at the beginning of a farm share season but I've been trying my best to accommodate this craving by making a minimal number of leafy green dishes. Tonight I turned the salad into soup by browning up all of last week's garlic scapes, some vidalia onion, and most of last week's leftover greens including the Chinese cabbage, red leaf lettuce, green leaf lettuce, and mizuna. I added a little salt, pepper, chicken stock from the freezer, and milk before pureeing the mixture and serving it in a bowl with some Italian bread. 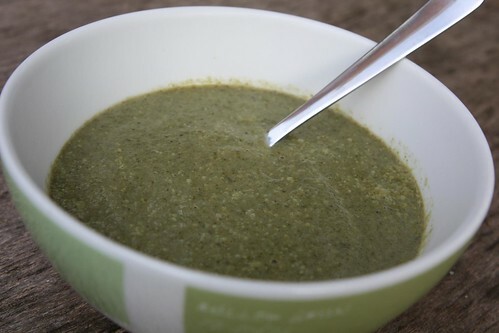 I have to admit that it was very strange eating soup out on the patio but it came out pretty good. Hopefully tonight I will not leave the pot on the stove with the remaining lettuce soup like the last time we had lettuce soup. Of course that was about four years ago. Jen made it and I foolishly forgot it on the stove top which resulted in a stream of four-letter words being strung together over breakfast the following morning. 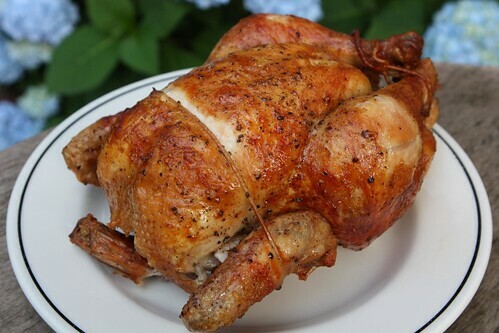 Since we're a little low on anything but lettuces I skewered a chicken and threw it onto the grill's rotisserie. 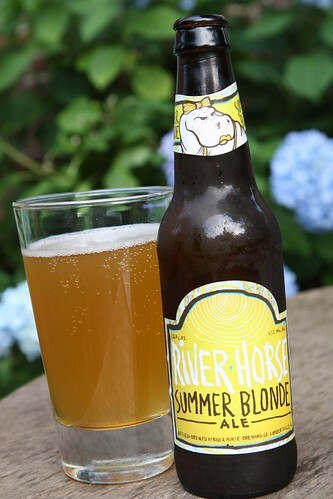 To accompany this odd dinner selection I chose this Summer Blonde Ale from River Horse Brewing Company. Summer is not really my favorite season for beers. Summer beers just generally are not really that exciting to me. However, having all these summer beers when it's in the low 70s may not be experiencing as they were intended. If I had this beer on a day in the 90s after mowing the lawn I think my opinion of it would be considerably higher. There aren't many beers that would disappoint under those circumstances. Of course since mowing the lawn is one of the worst tasks I can imagine I may opt to go for hard liquor should we ever be "fortunate" enough to live somewhere with a lawn that requires regular mowing. Labels: beer, Grilling, How'd we use it?, soup, What'd we get? I figure that I have roughly spent the equivalent of 45 days of my life mowing a lawn. So far I think I've spent less than an hour of my life. I think it might be the thing preventing me from wanting to own a house more than anything. Buy one close enough to your parents and I will mow the lawn. Mowing is one of the things I enjoy the most about summer. I know. I don't get it! Maybe if I actually did it I would find a love for it. But I don't think so. Not having to mow the lawn is one of the things I like best about living in a condo. (Not having to shovel snow is the other one.) I do miss the barbecue, however. Snow shoveling! Another plus to where we live!